For Treasure Chest Thursday, I looked at three clippings from the Donna Darling Collection which mention The Burns Theater. I love it when there are handwritten notes with photos and Donna’s notes made analyzing these clippings quite easy. One clipping mentions “Colorado Springs” and the other says Barnes Theatre – Colo. Springs Sept 17-18. I have cropped, edited, and sized these images for the web. The venue is the Barnes Theatre, Colorado Springs, Co. 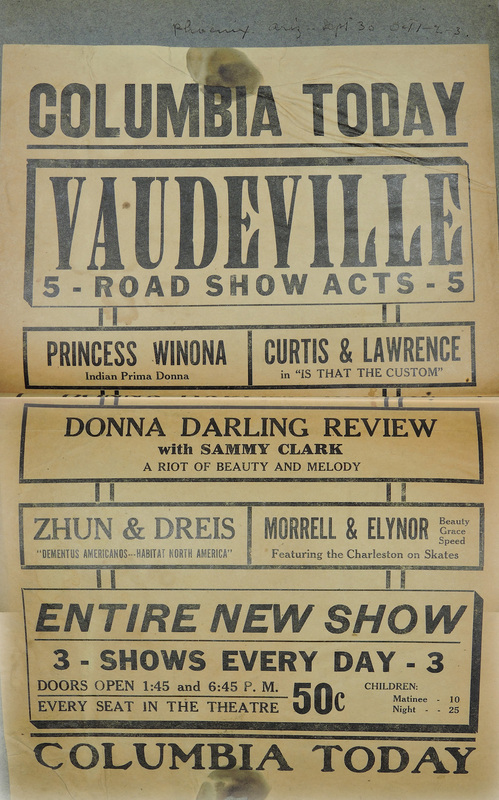 The theatre was part of the Western Vaudeville Managers’ Association. Seven other acts were on the bill and also had three shows daily. 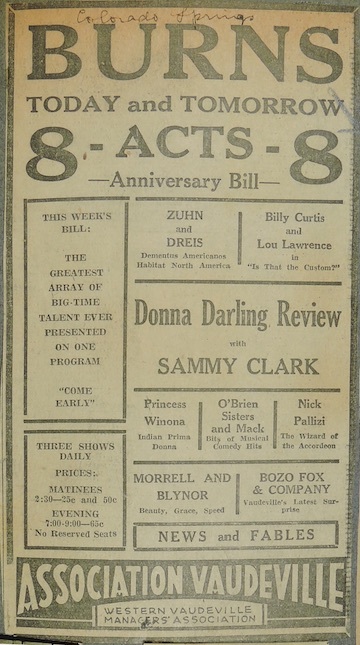 From other research, I know that the “Donna Darling Review [sic] with Sammy Clark” was a 1926 show. On September 7th, 1926, the show played in Alton, IL and on October 9, 1926, the show played in Santa Ana, California so its playing in Colorado Springs on September 17 and 18 makes sense. Donna played at the Burns Theater previously during her Chin Chin performances. 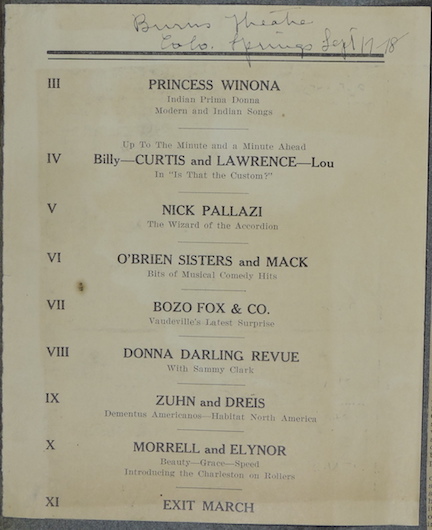 See: Donna in Colorado Springs, CO, November 19, 1919, at the Burns Theatre. This week on the Donna Darling “Treasure Chest” I have pulled three photos. Again, they were badly damaged. I have cropped and touched them up using Photoshop Elements to remove creases and tears as much as I could and still maintain the integrity of the photos. 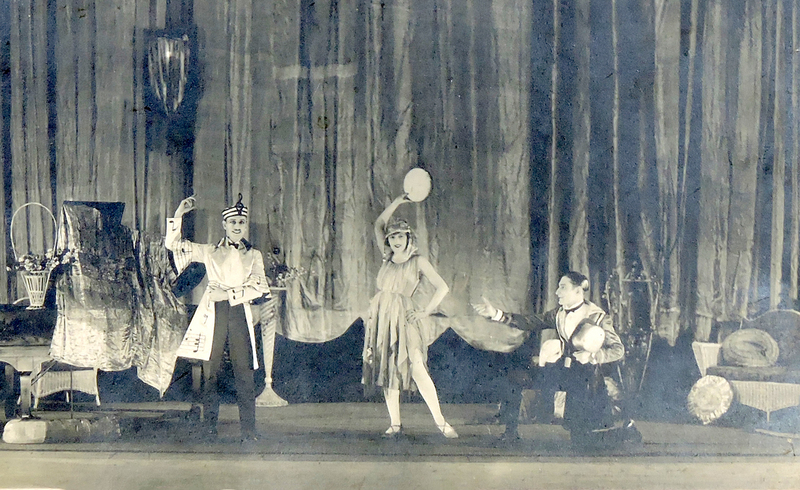 Donna Darling Revue c. 1927 – Photo by Theatrical ???? Next is another of the photo of the Donna Darling Review showing who appears to be Sammy on the left, Donna center stage wearing what looks to be a halo. With her are two “ladies in waiting” wearing elaborate costumes. Again, the photo was taken about 1927 and the location is unknown. The studio is cut off on the bottom right of the image, but clearly sans “Theatrical” something. The back says, “Donna Darling Review” in handwriting. I haven’t uncovered a show date for Donna to be in Montreal, yet but will continue researching her shows. 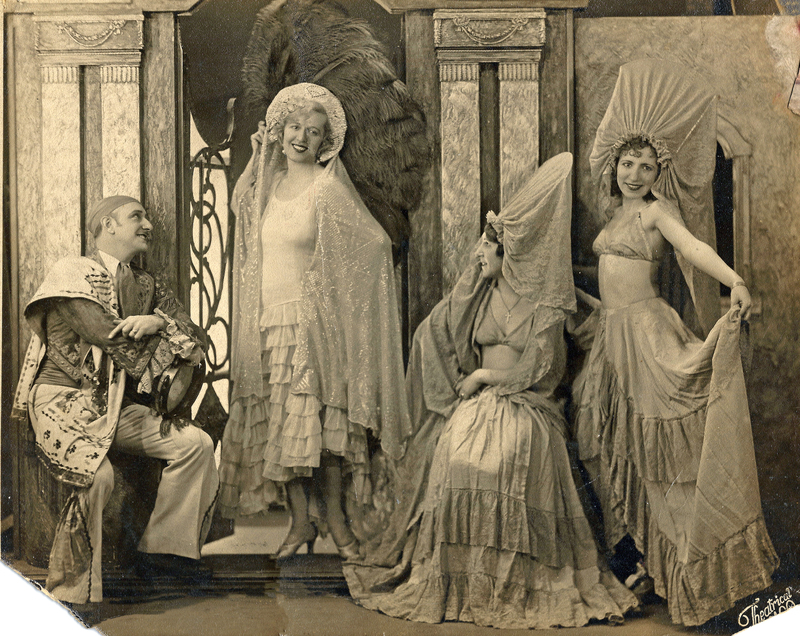 These three photos provide an interesting glimpse into the 1920s vaudeville world. The photos here were sized for printing (300 DPI) and are available from me at a higher quality if needed. Subsequent to this research, I looked further for an image of this photo shoot. I found a copy on Tumbir.